Newhall Land architect Tom Sutton hired Bay Area architectural critic Warren Callister in about 1963 to design a concept for the New Town of Valencia. 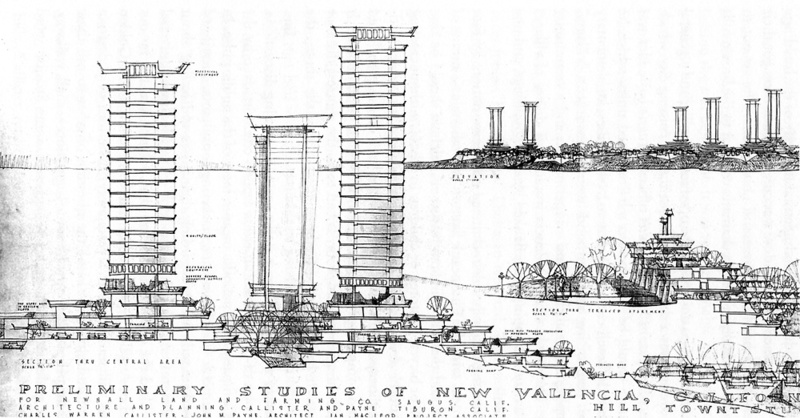 The original concept called for much more dense and housing with a higher population than was actually built: high-rise apartments for some 200,000 people, surrounded by wide open spaces. San Francisco planner and designer Warren Callister's plan was to preserve much of the flatland where cattle grazed for agriculture, grazing, and parks. His city would put people in compact units of hilltop towers, terraced hillside buildings, with a few valley complexes, all separated by stretches of open land. ... Callister described his idea: "A new city concept emerging out of the chaos of Los Angeles replaces the endless confusion of sameness with the heightened sense of a new and different place."